Ready to fly your new drone? Tips from a commercial drone operator for all new drone pilots. So you’ve just received a new drone and can’t wait to start flying. You want to capture the landscape, that amazing sunrise or grab a selfie (dronie). Before flying a drone for the first time, there are steps required to get your drone ready. These 10 drone tips should get you started with your new drone and get your aircraft ready for the sky. Drone "Fly Away": A drone "fly away" is a real issue. By preparing your drone correctly, you will have a more enjoyable flight and less likely to lose your drone (investment). A drone flyaway is generally caused by incorrect setups, pilot error and/or interference. These drone tips have been written specifically for new recreational drone flyers, specifically from questions I get asked regularly. Flying drones can be a lot of fun, especially with your family and friends. 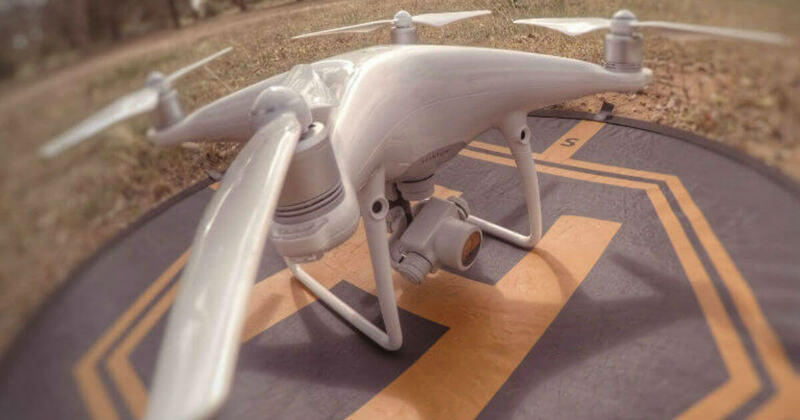 Although drones are not toys, Unmanned Aerial Vehicles (UAV’s) are sophisticated aerial vehicles with cutting edge technology, complex software and hardware under the hood. Note ***: For the purpose of this article, assumptions are made on DJI Drones, however, the same principle applies to all drones purchased. It is recommended to complete these tips in the following sequence. Open the box and remove all stickers from the drone. There may be stickers over air vents, sensors and hazard points. Remove them as they are only added for shipping the drone. Propellers are marked and are screwed on clockwise and anti-clockwise. (Remove propellers while indoors or updating aircraft for safety). DJI Batteries will generally be in hibernation mode. This means they won’t turn on unless you charge them first. Charge the drone battery and controller to 100%. Initial battery charge can take 1 – 2 hours to complete. Suggestion: Charge the battery from a wall outlet, not from a computer, or a low powered USB port. The first charge is very important for the life cycle of the battery, so charge it from a secure power source. LIPO Batteries are extremely dangerous. New DJI batteries are safer and have surge protection built in + overcharge and heat limits. However general rule is never to trust a battery while charging. You should also try to remain in the room or close by while the battery is charging just in case any issue was to occur. Example don’t leave your home while keeping your batteries on charge at home. Drone batteries can cause explosions, fire and must be protected from heat and cold. For this reason, I charge my batteries in a fireproof bag in the garage away from hazards. I also have a fire extinguisher since I have several batteries to charge. Once everything is charged, download the DJI GO App for your phone or tablet. Create an account with DJI. Full name, the serial number of the aircraft, controller, location etc. will be sent to DJI. This will be your master account for the aircraft as well as any warranty and support issues. The new update to DJI GO App may also prompt a short quiz/test which you need to pass before your first flight. The test covers basic drone safety and regulations. The answers are covered in the link below (Tip 10) on drone laws. Turn your controller on first. Then the aircraft. Depending on your aircraft, a double tap and hold will be sufficient to turn on power to your controller and aircraft. The DJI GO App should boot, if not then open the app manually. Suggestion: Invest in good quality USB cables between your phone/tablet and the controller. The difference can be a loss in transmission between aircraft and phone. (Loss of Video Signal). Connect your phone to data or Wifi, noting Wifi is better and more stable for the updates. As soon as you get into the DJI menu, the aircraft will check with DJI Servers for any firmware updates for your aircraft. Download and apply these updates. The process can take 30 minutes to 1 hour. Firmware updates are very important as it fixes bugs and issues with the aircraft. If this is your first flight, this is an important step. Follow the prompts and don’t touch the aircraft once the firmware update has begun. After firmware updates, restart both the controller and aircraft to make sure everything boots back correctly. After firmware updates, some settings may have changed. Make sure to check all aircraft settings including any personalised settings e.g. return to home, button configuration and video settings. Suggestion: I restart my phone and tablet to make sure any app issues are also restarted with the firmware update. IMU stands for Inertial Measurement Unit. I’ll keep it basic here, the IMU measures the linear and angular motion of the drone (Gyroscope). Most likely your drone has come from China, Singapore or the US, it may have been knocked around, dropped by couriers, shaken, travelled over continents etc. Calibrating the IMU is important and only needs to be done once. (Unless you crash your drone, then you need to do this step again). Calibrating the IMU will put all the sensors back into normal operating range. Suggestion: watch videos about IMU to find out further information. One of the main reason drones flyaway is due to poor compass calibrations. Take your drone outside away from any interference like buildings, concrete, metal etc. Calibrate the compass by rotating your aircraft. When calibrating make sure you’re not wearing a smartwatch, remove your belt, wallet, coins etc. Some roads have reinforced concrete and metal and this will create an issue with the compass. Suggestion: watch videos on compass calibration. The drone might have been knocked around while travelling to your destination. Calibrating the gimbal will give you straight images and video. If the horizon is tilted or the gimbal doesn’t reach the full extension, calibrating the gimbal may fix the issue. Suggestion: watch videos on gimbal calibration. You can also check the airspace on the CASA website before you fly. Always check current Australian Recreational Drone Laws before you fly and be familiar with drone regulations. I hope you find these 10 drone tips useful as a new recreational drone flyer. Flying drones can be a lot of fun but ensuring you keep a well maintained and updated aircraft is important. This will enable pilots to enjoy their investment and fly safely in the sky. Enjoy your time as a drone pilot and if you have further questions, please send them to me. You can contact me via this website, email, or on my social media sites. PS - Let me know if I have missed any points with the top 10 drone tips. #BendigoAerial - Information regarding drone mapping, aerial survey, construction progress and aerial inspections added. Visit Commercial Services.